4. Cara bikin alisnya gimana? How to make your eyebrow to be like that? Well, I'll share it to you..
2. First thing you should do is, start draw a frame or shape of eyebrow that you want.. This step is the most essential and need full concentration.. Since left and right eyebrow should be even and precisely draw. All you need is relax hand and sharp eyebrow pencil. 3. After shaping/ framing is done, you may start coloring it. 4. Still looking harsh and stiff right? Shades the inner tip of your eyebrow using the cap of the pencil or you can use your finger instead. 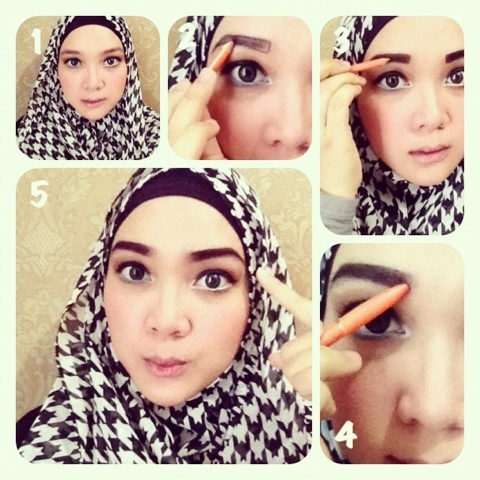 By shades them, your eyebrow will looks more natural..
5. Tadaaa! And its done.. You can see a huge different between picture 1 and 5, can't youu? NB: you may use any brand of cosmetics and color as you like. pensil alisnya pake apa kak? waaah.. bagus, bisa dicontek tuh..